Mostly family friendly: high-school age and up. To purchase tickets visit brownpapertickets.com. Elaina Davis in Ghost Light: The Haunting. Photo by Michael Blasé. 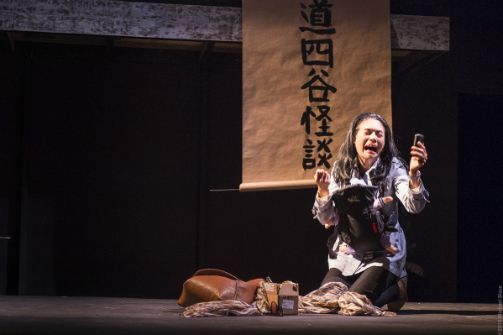 BOTTOM LINE: A popular Japanese ghost story retold as a play-within-a-play tribute to Macbeth with kabuki influences. 'Tis the season of undead indulgences! Ghost Light: The Haunting, by Carol Fisher Sorgenfrei, co-produced by La Luna and Devil In The Machine, is a campy riff on the popular kabuki play Yatuya Ghost Stories. The original follows the fate of Oiwa, a peasant wife poisoned by her husband who comes back from the beyond as a vengeful spirit who haunts her treacherous spouse. Ghost Light: The Haunting offers up a fresh, modernized take as play-within-a-play of two Broadway-bound theatre stars with chilling yet cheeky homages to kabuki and Shakespeare's Macbeth. The subject matter is cleverly chosen as The Legend Of Oiwa is a celebrated bit of cursed Japanese lore much like its western contemporary Macbeth (AKA The Scottish Play AKA That Which Must Not Be Named Within A Theater), with both having massive influences on various pop-culture and entertainment trends around the globe. Songfrei and her director Penny Bergman conceived Ghost Light: The Haunting in what seems to me as a noble effort to honor the supernatural superstitious mystique around the Macbeth and the Legend of Oiwa while delivering a genuine cross-cultural celebration of the revenge genre. Bryan (Greg Brostrom) and Keiko (Elaina Erika Davis) are a pair of brilliant TV and Broadway stars on the rise, collectively known to their fans as BreIko. BreIko live by a code of truth and honor, sharing a professional contract which binds them to only take roles that both partners approve of for each other. BreIko represents a rather noble model for artists trying to stick by a strict code of moral and aesthetic ethics. Keiko, in particular, pursues only roles which celebrate the female experience and accurately portray the Asian-American experience. When a dream gig double-bill role comes across Bryan and Keiko’s way—to play Macbeth and Lady Macbeth opposite one another—their relationship gets tested by a bigoted, self-important, tasteless, legendary director. When Keiko refuses to pursue her big break, it jeopardizes Bryan’s chances at stardom as well. As his ego swells, Bryan seeks the aid of his sinister manager who crafts a grizzly plan which might tear the “unbreakable” couple fatally apart. Always relatable, Davis delivers a delicate balance of both discontent lover and an up-and-at-em optimist. Brostrom does an admirable job carrying most of the piece; a charismatic picture of a proud celebrity, Brogstrom brings charm and vulnerability fluidly shifting between moments of regret to egotism, and shallow resentment. Patrick Gross pulls double duty as the slick and slithering manager manipulating Bryan’s rise to stardom, as well as embodying the over-the-top and bigoted Broadway director Hellen Gates Porter in bawdy drag. Although Gross’s drag gets into some problematic gender politics it is certainly a crowd pleaser, full of rollicking romp. The cast of supporting characters and ensemble keeps us hooked into this pleasantly unpredictable theatrical experience from start to finish, and deserve a hearty round of applause. Matthew Miller's set is simple yet malleable, finding synergy between the subtle kabuki elements and the rapid scene shifts. Gina Cercone’s vibrant costumes combined with Norman Bryn’s and Christin Andry mix of traditional and neo-horror makeup and hair craftsmanship are all together eye catching and full of authentic character. The live score by Yukio Tsuji and Sumie Kaneko is breathtaking—it is enough of an experience to see this production just to witness the work of these world-renowned musicians. Swift and full of adrenaline, Penny Bergman’s direction is confident and keenly aware of the power of pace. She boldly crafts a unique style with influences beyond kabuki and Shakespeare, finding well placed touches of TV crime-drama and old-timey vaudeville. You can tell Bergman is having a ball with Carol Fisher Sorgenfrei’s rowdy comedic haunted opus. Sorgenfrei’s script has a strong sense of self, with moments of horror comfortably sharing the space with scenes of high comedy, romance and even magic realism. Ghost Light: The Haunting is written by Carol Fisher Sorgenfrei and directed by Penny Bergman. It is co-Produced by La Luna Productions and Devil In The Machine. Joel Elins is the Production Stage Manaer. Scenic design by Matthew Miller. Light design by Eric Nightengale. Costume design by Gina Cercone. Fight Direction by B.H. Barry. Make-Up and Hair Design by Norman Bryn. Assistant Directors are Blayze Teicher, Jules Kourtis, and Becky Abramowitz. Assistant Stage Manager is Alexandra Tenenbaum.